St. Louis Blues goaltender Jake Allen, right, blocks a shot by Nashville Predators left wing Viktor Arvidsson in the third period of Sunday's game in Nashville. NASHVILLE — Vladimir Tarasenko put on quite a show to keep the St. Louis Blues' winning streak alive. Tarasenko completed a hat trick by scoring 16 seconds into overtime, and the Blues held off the Nashville Predators to win 5-4 Sunday, stretching their streak of victories to a season-best six games. This one came a day after they beat the Predators 3-2 in St. Louis. "I just tried to take it to the net," Tarasenko said of his winning goal Sunday. "I recognized I beat one guy. Good things happen when you go to the net. "It's an important game for us. It feels nice right now, especially back-to-back against Nashville. We got those four points. It's huge for our team." Tarasenko skated up the boards and across the slot before beating goalie Juuse Saros stick-side for both the victory and his 22nd goal this season. It was also the 200th goal overall and 10th overtime goal of his NHL career, resulting in his fourth hat trick in the league. "Possession to start is huge," Johansen said. "That's all that matters. We played our butts off, and they played their butts off. It came down to a mistake like that, and that should be addressed because that's not fair. (Blues center Ryan) O'Reilly is an unbelievable faceoff guy, and I just want it to be fair. It's too bad it ended like that." Pietrangelo and Tyler Bozak each added a goal and O'Reilly and Jay Bouwmeester had two assists apiece for the Blues. Jake Allen made 40 saves in his first appearance since Jan. 17. For the Predators, Viktor Arvidsson scored two goals — giving him an NHL-best 15 since Jan. 1 — Filip Forsberg and Roman Josi also scored, and Ryan Ellis and Ryan Johansen had two assists each. Nashville tied the score with a pair of goals over the first 6:10 of the third period, and it was Tarasenko who put the Blues ahead. He got the benefit of a bounce to beat Saros at 7:06 for a 4-3 lead. 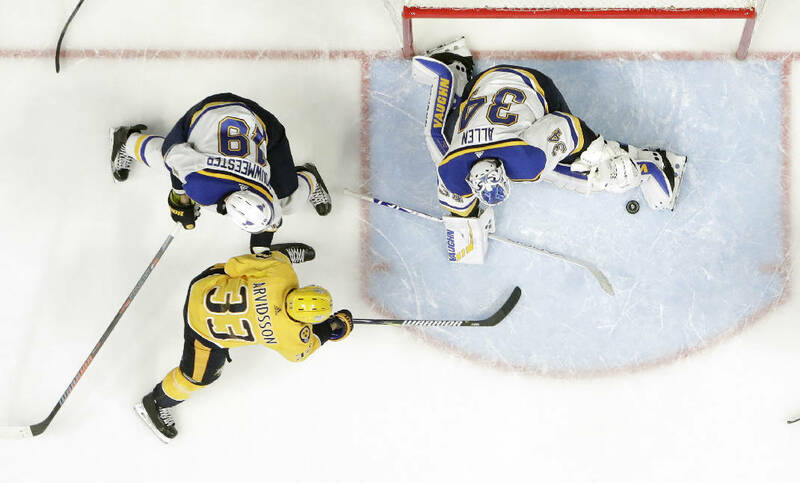 Forsberg tied it up for Nashville at 12:53, and Tarasenko, who nearly scored within the final 80 seconds of regulation, could not be stopped in overtime. The Blues have won seven of their past eight, pushing themselves into the second wild-card spot in the Western Conference. Nashville, which came in one point behind Winnipeg for the Central Division lead, had won six straight in this series on home ice, outscoring the Blues 26-8 with a couple of shutouts in that run. Now the Blues are 3-1 this season against the Predators with the final game of their season series Feb. 26 in St. Louis.